SOUTH CHINA SEA - The crew of Military Sealift Command's fleet ordnance and dry cargo ship USNS Wally Schirra (T-AKE 8) rescued five Filipino fishermen off an adrift and distressed boat in the South China Sea, Oct. 8. 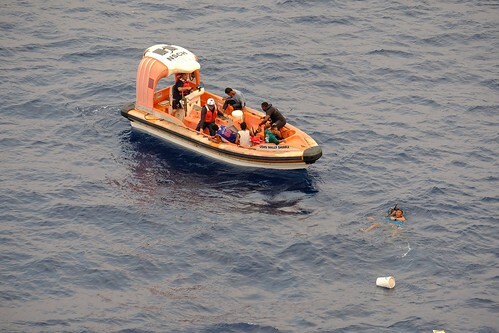 According to the rescued individuals, all personnel from the boat survived despite being adrift for approximately five days. Wally Schirra was conducting a routine mission when the watch officer and lookout spotted the individuals in apparent distress on an adrift boat. 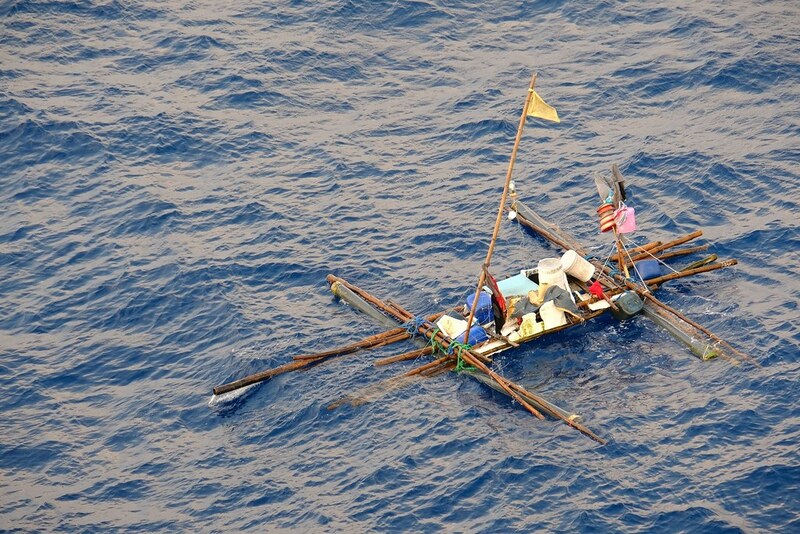 "Luckily, we were going at a slow enough speed to have spotted the fishermen," said civilian mariner Capt. Keith Sauls, USNS Wally Schirra's master. "The individuals were waving their arms and a flag in the air. They were also flashing a white light that was previously thought to be a fishing buoy. The watch officer notified me, then the chief mate of a possible rescue situation." According to the fishermen, their boat sank Oct. 3 after the hull was punctured by the bill of a blue marlin, estimated at 6-feet long and about 200 lbs. 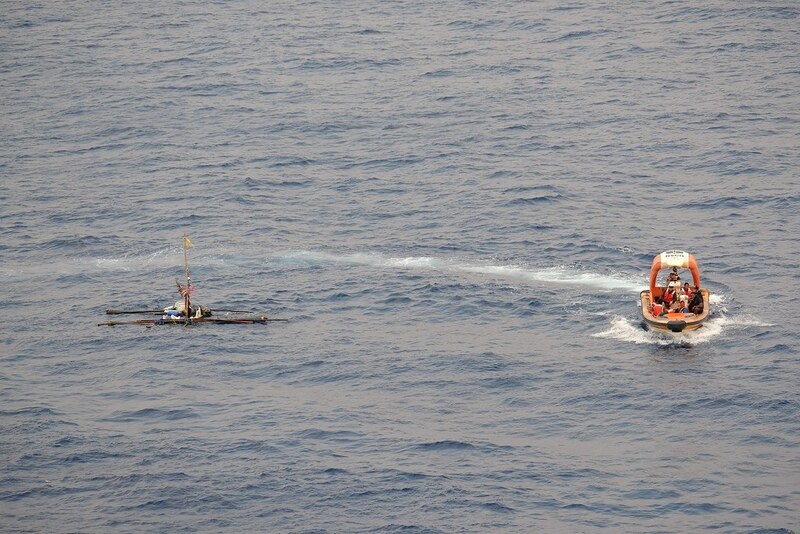 "The fishermen salvaged what they could from the rapidly sinking boat, removing the outriggers and planks to turn it into a raft with floats and barrels underneath for floatation," said civilian mariner Leon Hadley, chief mate, USNS Wally Schirra. "They took with them some rice, clothes, batteries, an 8-watt bulb, an AM-receive only radio and a handheld GPS. They had no water." As the Wally Schirra closed the distance with the distressed boat, the fishermen entered the water and swam toward the Wally Schirra. A rigid-hulled, inflatable boat and search and rescue swimmers deployed off the Wally Schirra and pulled the fishermen to safety. Aboard the Wally Schirra, qualified personnel conducted an initial medical assessment and security search of the individuals and their possessions. "We received the clearance to go into Subic Bay and the fishermen were transferred to the Philippine Coast Guard while at sea," said Sauls. The fishermen thanked the crew of the Schirra for rescuing and housing them, and for their generosity in providing them with spare clothes and cash donations. "On average, death results two to three days after a diet of drinking undiluted salt water or urine in survival-at-sea events as it takes more water than is consumed for the body to process the waste and salt out of the kidneys, leading to a build-up of salt and toxic ammonia in the body which only deepens the cycle and quickly leads to death if not stopped," said Hadley. "We're all lucky we found them when we did." Wally Schirra is currently operating in the U.S. Navy 7th fleet area of responsibility.